If you are looking for a sweet oceanfront retreat, this 2 bedroom/1 bath condo is a gem! OC207 has been newly remodeled and offers a more spacious kitchen and bathroom than most Ocean Cove units. Soothing neutrals, new furniture, LVP flooring, and ceiling fans add to comfort and ambience. The living room and master bedroom have TVs. The master has a queen bed, and the loft has a queen and single. Children will love the bunkbed nook. The private pocket balcony with a bistro table and chairs (plus additional stackable chairs) is your early-riser spot for coffee. This is a linen-ready condo - just bring your beach and pool towels. Maximum sleeping capacity is 7. 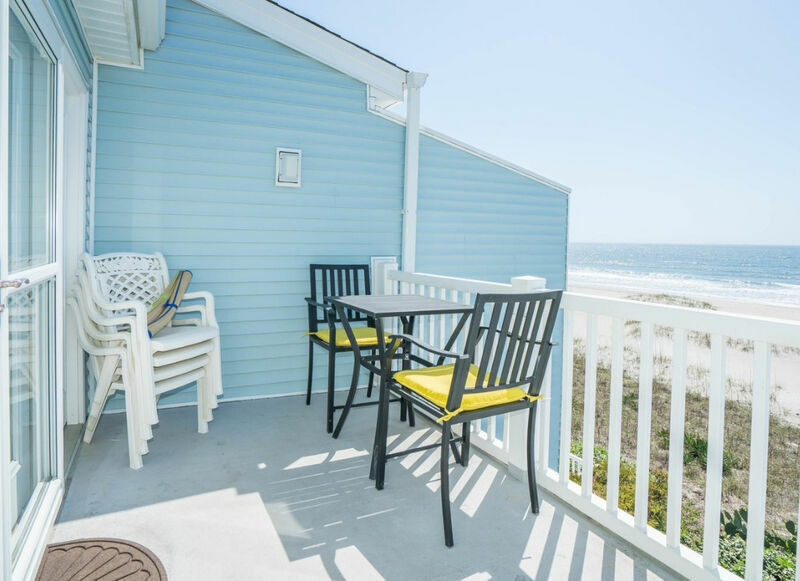 The complex is located conveniently in the heart of Ocean Isle near restaurants, shops, the pier, and putt-putt. Guests can enjoy an oceanfront swimming pool and spa, direct beach access, outside showers, and a shared grilling area.